t*rexes and tiaras: It's like we burned so bright we burned out.. Being in something of a weird headspace lately, I've been feeling less and less happy about clothes and outfits and just about anything relating to my body image / self-confidence. So, I've been less inclined to share outfit posts I guess. 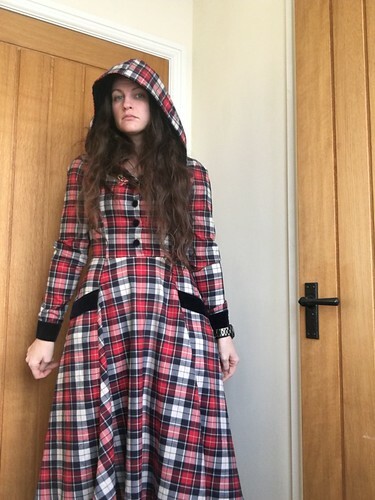 But, in an attempt to snap out of these thoughts, here's a dress which I bought in the Collectif sale at the start of the year and have barely worn, but kind of love for the hood, which feels like a big hug. Helpful when temperatures in the office reach parky. 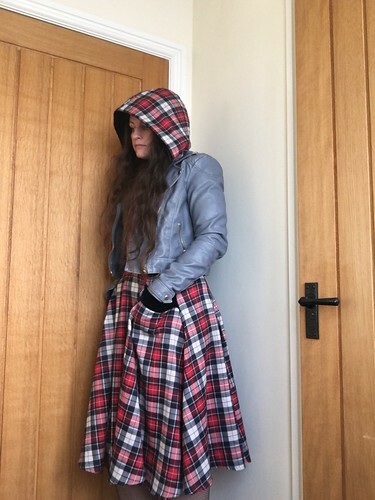 Something which I have been loving lately is trying to find present ideas (yes, the dreaded C word has begun) which are new and different and in doing so, I stumbled upon Eilidh's Instagram account. 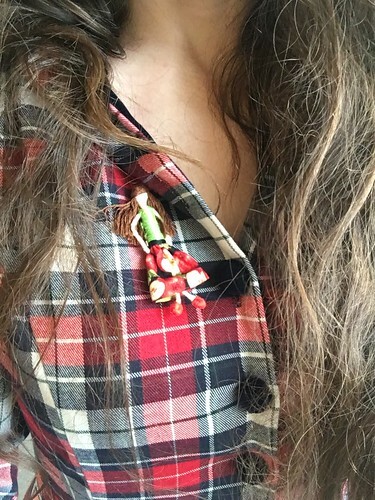 She's raising money for a world trip next year by selling these little miniature people brooches and has been coming up with some awesome ideas. Not only can she make mini-versions of you (see mine above), but also mermaids, super-heroes and just about anything else once can think of. I love them and they'll be winging their way to some of my gift recipients this year, too. What's better when you're feeling a bit down than donning a pair of shoes which you love..? Although there are quite a few pairs I've been mulling over lately, I've not actually added to my shoe collection in quite some time.. This could have something to do with the fact that I'm running out of space on the shoes shelves, but also that I do have a lot of pairs which just don't get enough wear as it is. 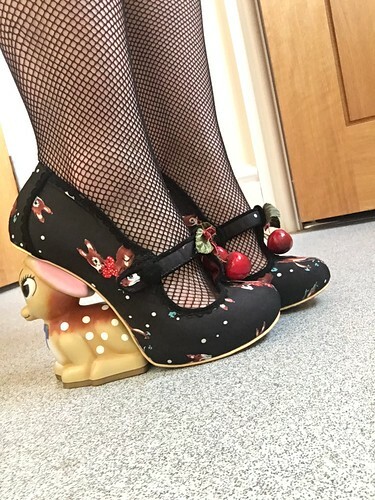 These Cherry Deer heels are great since they were sent back to be stretched (they'd been size-labelled wrongly to begin with, IC think) but since then they've been great and are super comfortable! The only thing being that people do tend to stop to comment on them. Aside from my ongoing body battles, all other aspects of life are very good of late. I have another lovely weekend to look forward to with one of my favourite people and things are, in all respects, pretty good. So pleased things are going so well. Collectif sales are the best. I love reading blogs still. These shoes are v cute too. I adore that dress, it is so pretty! I would smile if I were wearing such a gorgeous dress! Is it brushed cotton? The brooches are a very good idea for that lady to raise some money, very innovative although I find doll things, esp those without faces, a little creepy, but I do think being able to personalize them a sweet idea! Those shoes are so fun, I so like those cartoon deer, possibly more than most of the other statement heels, even if I wouldn't be able to wear something of that height. Glad that you have a,lovely weekend planned even if your brain has been a bit messed in terms of body confidence. I am aware that I look pretty awful in terms of haggard face in recent times and feel rather old, but I just don't seem to have the time to think about it too much but it would be nice to not feel I look haggard! I know what you mean about saying you're short on time. It seems like a competition doesn't it? It's about time we stopped the glorification of busy. It's the cause of so much stress. However you do seem to always be on the go, so you're entitled to say it. What irks me are people who always insist they're 'the busiest'. Honestly who cares? I'm glad things are going well. It's a shame body confidence is low, because you really have no need to feel this way, but I do understand that it won't change how you feel, no matter how many people say it. Our own minds really are our own worst enemy sometimes. Hope you enjoyed your lovely weekend!